On Christmas Eve, Faysal Ishak Ahmed, a 27-year-old Sudanese refugee, died in Brisbane a day after being medivacced from Manus Island. Faysal had been sick for months—he had suffered seizures for weeks, had requested medical help from IHMS, but had been turned away. Just days before his death 60 Sudanese refugees had sent a letter to IHMS and Border Force pleading for Faysal to get medical assistance. He collapsed, fell and struck his head in the evening of Thursday 22 December, was brought to Brisbane on the afternoon of Friday 23 December and died on 24 December. It seems Faysal suffered severe head injuries after he suffered yet another seizure and fell. But regardless of the immediate cause of death, Faysal was killed by Australia’s offshore detention system. The responsibility for his death lies with Immigration Minister Peter Dutton. Like Hamid Khazaei, a Manus refugee who died from blood poisoning in a Brisbane hospital in 2014 after Border Force delayed approval for his evacuation, we will have to wait for the inquest to know the immediate role of IHMS and Border Force in Faysal’s death. But their responsibility is crystal clear. Faysal should not have been on Manus; he should have been in Australia. He should have got the medical attention he desperately needed. Faysal’s needless death sparked an immediate reaction on Manus Island. 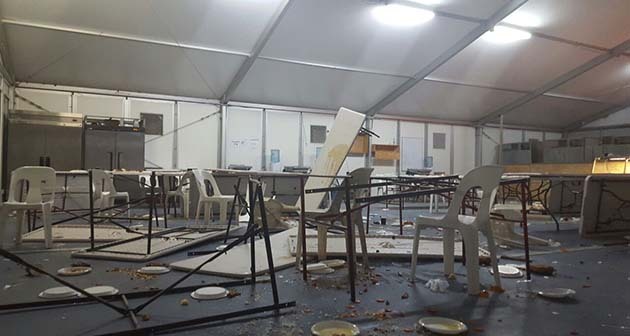 That night, angry refugees staged a protest, overturning tables in the mess area, forcing the Wilson security guards and Border Force officers out of Delta and Oscar compounds. Faced with protests spreading throughout the detention prison, officers and staff also withdrew from Mike and Foxtrot compounds. Sickened by Faysal’s death and the dismissive comments from Peter Dutton, hundreds of people attended vigils for Faysal held around the country. In Melbourne, following the vigil, protesters including the Sudanese community blocked a city road. 2016 was bookended by the horror of Faysal’s death in an illegal detention centre and the new year’s eve bashing of two Iranian refugees by PNG immigration officers and police. Like Faysal’s death, the bashing highlighted the ever-present violence on Manus Island. With no legal aid, no lawyers, an arbitrary court system that has nothing to do with justice for refugees or locals, the PNG police are judge, jury and executioner because Wilson’s Security and Broadspectrum have no lawful authority to regulate or detain. To emphasise the refugees’ precarious existence, in the aftermath of the bashings, Border Force held meetings announcing that refugees would only be considered for resettlement in the US if they moved out of the detention centre to the East Lorengau Transit Accommodation. But there is nothing certain about the US deal and no reason for refuges to live in East Lorengau. Moving refugees to East Lorengau is something Border Force and PNG immigration have been trying to engineer since before the Manus hunger strike two years ago—to no avail. Life is even more precarious in the Transit Accommodation. Anxiety over the US deal is also growing on Nauru. Despite US officials being on Nauru since 7 January, there has only been one round of interviews that ended in December last year. As Solidarity goes to press, Donald Trump is due to be inaugurated. If the US resettlement deal survives Trump becoming president, there is still no guarantee that the deal will apply to anyone on Manus. What is certain is that the US deal will not resettle everyone. That’s why the movement still has to fight to bring all the asylum seekers and refugees to Australia. The Senate Inquiry into offshore detention is set to investigate Faysal’s death and is due to report on 30 March. It will potentially provide even more ammunition for the movement to campaign to end offshore processing. The same day that a new report said that the Liberal government wants to claw back $1.5 billion more from pensioners and the disabled with its Centrelink debt recovery scheme, the Australian National Audit Office (ANAO) found that there was no authorisation for $1.1 billion spent on Manus and Nauru between September 2012 and April 2016. The lawless indifference of the government costs money; and it costs lives. There will be no justice for Faysal until Manus and Nauru are closed. This year’s Palm Sunday refugee rallies on 9 April need to be big.